Thanks to all those pesky closures now have a shiny new 10-mile carpool lane. What we don&apos;t have is less traffic, according to a new study from traffic service provider INRIX. Jim Bak said its analysts found "relatively no change" in travel speeds and times. The company compared data between the second and third weeks of September in 2013 and those same weeks in 2014 on the northbound 405 between the 10 and the 101 freeways, according to KNX. Between 4 and 7 p.m. it looks like the average travel time between those two freeways is actually about a minute slower than last year, KPCC notes. It&apos;s not all bad news: INRIX notes that rush hour seems to be ending earlier. Last year it took about 28 minutes to drive from the 10 to the 101 between 7 and 8 p.m. This year it took 22 minutes. Just because traffic isn&apos;t any better doesn&apos;t necessarily mean the carpool lane was a complete waste of 5 years and $1 billion dollars. Bak says that traffic tends to get worse as the economy improves, so keeping traffic levels steady might be an accomplishment in itself. Then again adding more roads or lanes or even more public transportation options usually doesn&apos;t reduce congestion, so we shouldn&apos;t be all that surprised. 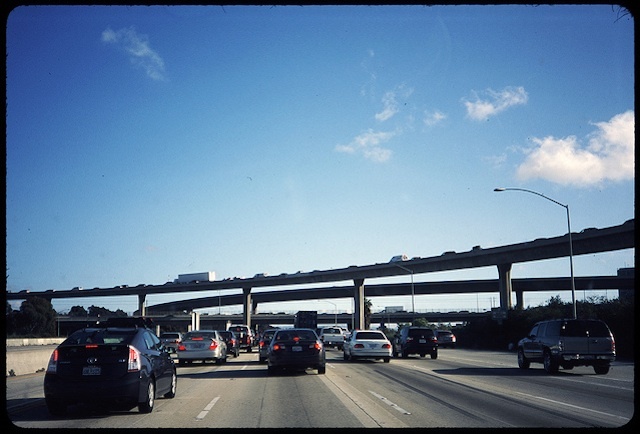 Economist Matthew Turner told KPCC, "There&apos;s a lot of trips that you don&apos;t take because you don&apos;t want to drive when it&apos;s congested and if it&apos;s little bit less congested there&apos;s a lot of trips people are willing to take." Metro spokesman Dave Sotero told L.A. County Supervisor Zev Yaroslavsky&apos;s website that Metro&apos;s goal wasn&apos;t necessarily to cure the rush hour blues but to move more people. And the carpool lane is just one part of that. There are plans, however hazy, to bring public transportation to the Sepulveda Pass (perhaps a bus, underground train or aerial tram). "We are taking an &apos;all of the above&apos; strategy to improve mobility in the Sepulveda Pass," Sotero said.